A year ago Scott’s mom gave us a call and asked us if we wanted to see the touring production of “The Lion King” and I immediately said yes and crossed my fingers that Ivy would be old enough to enjoy it. Any time we started planning something for the summer, we would double-check the dates for our tickets so that we made sure not to mess us up. A couple of weeks before the show, the girls saw these adorable skirts at Costco. They started begging us to get them. We told them no and walked past them. A few days later I went back and got them without the girls knowing. (Okay I kept it a secret only as long as it took me to get home because they saw them in the back of the car). Every day they would ask when they were going to get to wear their skirts. The day finally came and I laid out their skirts. They were so excited and knew we were doing something special. 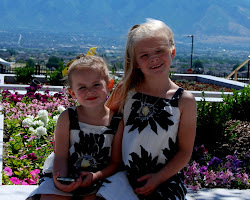 They knew that I wouldn’t let them wear their skirts because I had them hidden for weeks. Oh, I had told them we were going to see “The Lion King” but it didn’t really mean anything to them. They’d seen the movie and had no idea what to expect. And I opted out of showing them clips on YouTube, mostly because I didn’t want them to have preconceived notions about whether or not they would enjoy it. (If I had it to do over again, I would still not show them any video footage, their surprise was priceless). The girls were so excited. We like to go to dinner before we go to the theater. If it is just grown ups, we prefer to go to the New Yorker in downtown. But when we go with a group of kids the New Yorker isn’t really appropriate. So, we decided on the Old Spaghetti Factory. This is one of my girls’ favorite places to eat. They have a fantastic kids menu, and they will allow you to select items from the grown up menu (like mizithra cheese with browned butter) and have in kids portions. Plus, the ice cream for dessert is always a special treat. Ivy gets vanilla and Jade gets spumoni. After the yummy meal of pasta, sour dough bread with garlic butter and ice cream, we were on our way to enjoy the evening. Scott dropped us off by the door and we did a quick photo shoot while we waited. Then while we were hanging out, my dad saw an old friend that had just been interviewed by the press. My mom had my dad’s ticket and she was already inside. So, my dad walked in with his friend and no one ever asked to see his ticket. Which was good, since my mm was nowhere to be found. As the show began, the girls were wide-eyed and gaping mouthed. It was so fun to look over at them and see their excitement. That face continued through the whole show. Our one mistake for the evening? We went to the bathroom during intermission and had to wait in a FOREVER long line. By the time it was our turn, the intermission had ended and we missed the big production number. Of course it was the one number when the animals were up by our seats. The girls were pretty bummed to miss it, but we saw the actors out in the hall before they went on stage. Final remarks from the family members? Next year the show is Mary Poppins. I can’t wait to take the girls. I’ve heard amazing things about it and think their eyes will be just as wide when she comes floating in with her umbrella.